Whoa. Is anyone else noticing that the older you get, the harder the holidays seem to hit your waistline? Or is it just my ridiculously over-indulgent eating and not something I can blame on the ever progressing hands of father time? Either way it is definitely in order to spend a bit of time with the Apples portion of this blog. After all, Apples and Butter is supposed to be about balance. I fear my tendency is to ignore the healthier side of eating, both on this blog and in my kitchen! After three months of indulgent eating (anything post-September counts as the holidays to me), I wasn’t quite ready to switch over to carrot sticks and salads. Enter Sunset Magazine with their revamped comfort foods. This recipe for clam chowder remains creamy, but is made primarily with low-fat milk. It made for a great post-Christmas meal with my family. Warm and indulgent enough to be fully satisfying and comforting while not packing on the calories and fat content that would have come with the quart of heavy cream called for in the original recipe. Enjoy this with nothing more than a loaf of crusty bread and congratulate yourself on indulging while still managing to cut back on calories. Heat the oil in a large pot over medium heat. Sautee the onion, celery, carrot and garlic until starting to soften. Transfer to a plate. Add the bacon to the pan and cook until crisp. Drain the bacon on paper towels and discard all but 1 T of drippings. Add the flour to the drippings to make a roux and cook until slightly browned. Add the milk, one cup at a time, making sure each cup is fully incorporated before adding the next. Add the potatoes, clams, clam juice and reserved vegetables and season with salt and pepper. Simmer for 25 minutes or until the potatoes are tender. Add the thyme and half-and-half. Before serving, sprinkle individual portions with the bacon. I know the feeling. Holidays def hit us harder as we get older. But with a recipe as this, I don't have to feel bad about having this fantastic soup. This looks like a great easy to make clam chowder. Thanks for sharing! Your chowder sounds delicious. As to the weight as you get older - you don't want to know. It's best left a surprise. You are not alone--I feel like once I hit 30 the old metablism definitely slowed down a bit. Luckily there are delicious and healthy things to eat like this lovely chowder! Clam chowder is one of my favorites... Love the lighter version! This looks delicious! The waist thing, well that's why at Thanksgiving when my daughter asked us to share what we're thankful for, in addition to my family, good friends, wonderful pets, a beautiful place called home I honored all elastic waistbands. I think my brain still hasn't gotten the message about New Year healthy food because what's really seductive is the bacon! I have the same feeling. I think it's our metabolic rate slowing down =( I like how this is made with low fat milk instead of cream! yum! The restaurant i managed in Maui hawaii was renown for its clam chowder. In fact even new englanders would say it was the best they'd tasted. Naturally working in the restaurant meant I ate on a daily basis (NO JOKE) Till one day my husband answered YES when i asked him if my bum looked big in the outfit. I NEVER HAD IT AGAIN! Thanks for visiting my blog. We actually spent almost 5 years in England in all before moving back to the states. I now write a food and life article for a small ex-pat mag out of London which is what is reprinted on my blog. I now go back frequently to "refresh" my memory. Tough job but someone's gotta do it. I envy your time in London, it is my absolute favorite city in the world. Thanks so much for the lighter recipe for chowder. It is my son's favorite but I don't often make it because of the calories. Maybe now my skinny son and his voluptuous mom can both have it again. 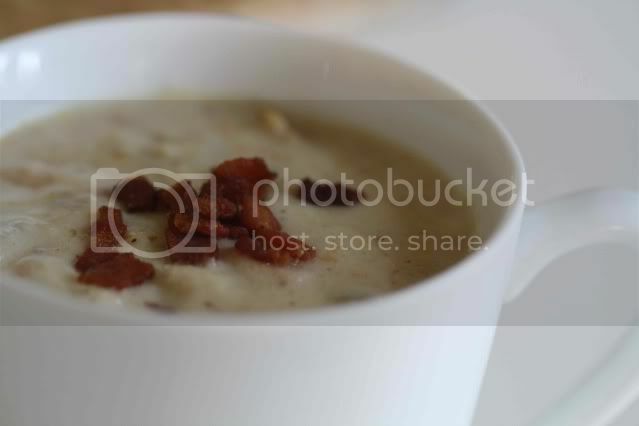 We love clam chowder ~ I'm always on the look-out for healthier recipes. It looks delicious! i hear what you're saying. i'm picking up what you're puttin' down. the holidays are harder and harder on my pants every year. good for you for lightening up a classic--your modifications sound reasonable and doable! Sounds great! My husband has been requesting oyster soup/stew/chowder recently, and I love the lightened-up aspect of this one. I have a recipe for crab bisque which is thick and creamy due to puréed potatoes and other vegetables instead of cream. Every time I make it, it's a winner. Thanks for such healthy recipe. I would like to make it with meal. So glad to have found this recipe site. Clam chowder! Healthier? I will have to make it for sure! Thanks for the recipe!